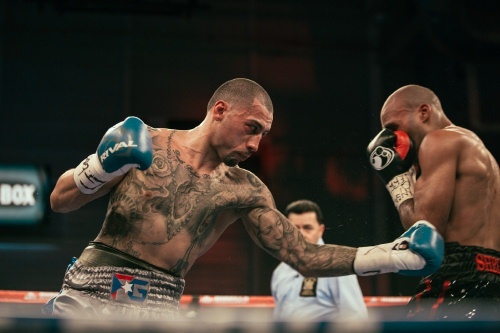 NEW YORK– Undefeated super welterweight Frank Galarza put on a show for his hometown fans, knocking out Sheldon Moore in the third round of the main event of ShoBox: The New Generation on Friday at the Aviator Sports and Events Center in Brooklyn, N.Y. Known as “The Brooklyn Rocky,” Galarza (17-0-2, 11 KOs) may have graduated from prospect to contender with yet another early round knockout on the prospect developmental series. Galarza staggered Moore with a big left hook in the third and then attacked with a series of shots to the head and a big right hook to the body that floored the Belgian boxer. Moore (13-3-1, 9 KOs) looked determined to get up but was unable to recover and was counted out at 1:41 as he lay on the canvas for the first time in his career. “It feels great. It’s amazing to get that knockout in front of my home fans,” Galarza said. “He was tough and he came to fight, but we executed the game plan and got him out of there. I hit him with that left and I saw he was hurt. I went body, head, body, head and finished him. Moore acknowledged he was hurt but said he would have liked to continue. In the co-feature, undefeated middleweight prospect and former amateur standout Ievgen “The Ukrainian Lion” Khytrov went the distance for the first time in his career, outpointing slick southpaw Aaron Coley via unanimous decision, scored 78-74, 79-73 twice. Supremely talented yet largely untested as a pro, Khytrov (10-0, 9 KOs) had to work to win the lopsided decision. The Ukrainian, who had over 500 amateur fights, was coming off the longest bout of his career, an eighth round TKO over Jorge Melendez just over a month ago. Fighting a southpaw for the first time as a professional, Khytrov had trouble working the angles and was not able to cut off the ring against the durable Coley, who went past the sixth for the first time in his career. Khytrov appeared frustrated in the middle rounds with his inability to finish Coley (9-1-1, 6 KOs), but he continued to break down his previously undefeated opponent and pocketed rounds with little question. “It was a good fight, but I saw some flaws that I need to work on,” Khytrov said. “But it was a short span between my last fight and I think it showed in the ring. Coley, who was taking a huge step up in opposition, was unimpressed with Khytrov’s much-hyped power. In the opening bout of the telecast, blue-chip super middleweight prospect Sergiy Derevyanchenko dominated Alan Campa, knocking down the previously once-beaten Mexican en route to a fourth round TKO (1:17). Known as “The Technician,” Derevyanchenko utilized combos to set up a devastating right hand that seemingly landed at will. The Ukrainian dropped Campa with a huge right with 20 seconds left in the second, just the second time that Campa touched the canvas in his career. Derevyanchenko (5-0, 4 KOs) broke down Campa in the third and scored his second knockdown in the fourth. Campa got up but was in trouble monents later and the referee halted the contest at 1:17 with Campa (13-2-1, 1 NC, 9 KOs) defenseless against the ropes. The event was promoted by DiBella Entertainment in association with Fight Promotions Inc. and New Legend Boxing. In an action-packed six-round junior welterweight contest, Brooklyn’s Mikkel LesPierre, defeated Carl McNickles, of Chicago, via unanimous decision on scores of 60-54 twice, and 59-55. LesPierre, who was the faster fighter and much more accurate with his punches, improved to 7-0-1 (3 KOs), while McNickles fell to 8-8 (6 KOs). Brooklyn’s Travis Peterkin used his piston-like jab to control Donta Woods, of Atlanta, Ga., and keep him from landing anything significant in return. As the rounds wore on, Peterkin began to unleash more and more of his arsenal. After five completed rounds, Woods did not come out of his corner for the next stanza, awarding Peterkin, now 15-0 (6 KOs), the TKO victory. Woods’ record fell to 8-4 (7 KOs). World-rated junior featherweight contender Rafael Vazquez, of Brooklyn, obliterated Andre Wilson, of St. Joseph, Mo, inside two crackling rounds. Vazquez’ key weapon against Wilson were his uppercuts. Using that punch in combination to the head and body, Vazquez dropped Wilson in the opening frame, while also bloodying his nose. Uppercuts from both sides floored Wilson in the second as well. While he arose and gamely fought back, a left hook to the body followed by a right uppercut to the chin felled him again leading to the referee’s stoppage at the 2:56 mark. Earning a TKO2, Vazquez brought his record to 14-1 (12 KOs). Wilson’s record dropped to 14-9-1 (12 KOs). Maintaining a fast pace, Brooklyn’s Shawn Cameron easily outboxed Aaron Drake, of Kansas City, Mo., over six rounds. The busier fighter throughout, Cameron won a unanimous decision on three scores of 60-54, to improve to 9-0 (4 KOs), while Drake’s record dropped to 14-8 (9 KOs). Looking for openings, Brooklyn’s junior welterweight prospect Wesley Ferrer dominated every second of his bout against Bryan Timmons, of St. Joseph, Mo. Slowly breaking Timmons down, Ferrer was placing his shots well, consistently connecting with stinging straight rights to the body and hooks upstairs. A combination in the second knocked Timmons down, as he sagged along the ropes. Though clearly in pain, Timmons got to his feet to fight on. One punch later from Ferrer was all it took to convince the referee to halt the contest at the 1:38 mark, upping the Brooklynite’s record to 8-0 (5 KOs). Timmons is now 2-4 (2 KOs). Both Elisa Collaro, of Brooklyn, and Misato Kamegawa, of Fukuoka, Japan, in their pro debuts, came away without a win, as the four-round contest ended in a draw verdict. While one judge scored the bout 39-37 in favor of Kamegawa, he was overruled by two tallies of 38-38. In his first fight back since losing a majority decision in a ShoBox barnburner against Alantez Fox this past January, Freeport, Long Island’s junior middleweight prospect Patrick Day made a triumphant return with an impressive first-round TKO over Colby Courter. A short straight right dropped Courter, of St. Joseph, Mo., early then a left hook finished him off for the second and final knockdown. The time of the stoppage was 2:25. Day improved to 10-1-1 (6 KOs), while Courter fell to 6-6 (5 KOs).